Showing 3 articles from October 5, 2018. FRANKLINTON -- Thanks to its overall program improving and surging confidence level, Franklinton had a good feeling about the prospect of bettering last season's 34-point loss to Big East Conference rival Rocky Mount. 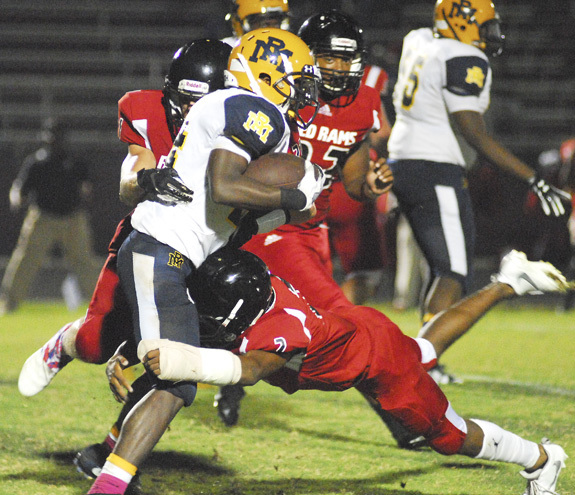 And for one half, the Red Rams lived up to that promise -- only to see the touted Gryphons pull away in the second half of action during Friday's meeting at the FHS Football Field. HENDERSON -- The early candidate for the Game of the Year in the Northern Carolina Conference was staged Friday night. ROANOKE RAPIDS -- Louisburg entered Friday's Northern Carolina Conference showdown at Roanoke Rapids with a two-game winning streak -- and plenty of optimism for a strong finish to the 2018 football campaign.